I first read about Azzi In Between at Playing by the Book, and instantly sought out the publishers who very kindly sent me a copy for review. Azzi In Between is a graphic novel by Sarah Garland, published by Frances Lincoln Children’s Books, 2012. One of the things I find most crucially important in children’s literature is the opportunity it gives kids to “walk a mile in another’s shoes”. 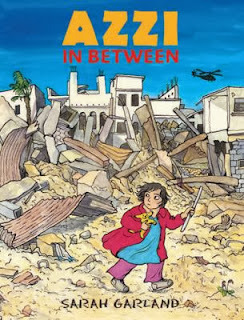 Within the pages of Azzi In Between, young readers can tread in the footsteps of a young refugee, forced to leave all that’s familiar and begin life in a new country. Scary thought! But the overwhelming message of Azzi In Between is one of optimism. Azzi and her family members go through very difficult times but there are positives about their new home: new friends, help from adults and children, access to support, and finding the familiar in a new place. As a reader, I notice I’m enjoying graphic novels more and more. What I love as an adult about picture books can also be found in a graphic novel or comic book: the fact that the illustrations are able to weave another strand to the story, add another layer of meaning. I found myself scrubbing away tears over the plight of the refugees, mostly because of the sheer desperation in their faces and bodies as they struggled to get onto an over-full boat. How incredibly lucky we are, those of us who have never had to flee our homes and fight to survive! Azzi In Between obviously worked well for me as an adult, but I think it will work well for kids as young as Grade 3 too. The text is mostly short sentences underneath each panel, with dialogue very occasionally in speech bubbles. This contributes to our feeling of looking at the story through Azzi’s eyes, vicariously experiencing her fear, loneliness and confusion. Older children will get even more from the story as they reflect on, and begin to understand what many of us take for granted. Children who are daunted by dense text will enjoy the format. Garland has a lovely simple illustration style that nevertheless portrays very real emotion and atmosphere. I urge you to seek Azzi In Between out for your homes and libraries. It’s an important book, one that contributes to our understanding of the plight of refugees, and promotes human rights. It also makes an excellent resource for children who have themselves experienced life as a refugee, one that will show them they are not alone. This sounds like a fantastic book - graphic novel - which schools should have. I think it's important that kids understand why some of their classmates have fled their countries for other safe havens. Good point +Kriss MacDonald! And important for those little ones who've arrived from another place to know that their feelings are shared by others. Lovely review Susan. I have started reading more graphic novels these days and am amazed at the quality of story telling done through this media. I loved Bluffton, cant wait to read Flroa and Ulysses. This one looks wonderful. Heading over to put this on our hold shelf! Thanks Resh! I think you're right about the quality - sad that to some they are still "looked down" on. I will look out for Bluffton and Firoa and Ulysses.